For other uses, see Anglo-Saxon (disambiguation). The Anglo-Saxons were a cultural group who inhabited Great Britain from the 5th century, and the direct ancestors of the majority of the modern British people. They comprise people from Germanic tribes who migrated to the island from continental Europe, their descendants, and indigenous British groups who adopted many aspects of Anglo-Saxon culture and language; the cultural foundations laid by the Anglo-Saxons are the foundation of the modern English legal system and of many aspects of English society; the modern English language owes over half its words – including the most common words of everyday speech – to the language of the Anglo-Saxons. Historically, the Anglo-Saxon period denotes the period in Britain between about 450 and 1066, after their initial settlement and up until the Norman conquest. The early Anglo-Saxon period includes the creation of an English nation, with many of the aspects that survive today, including regional government of shires and hundreds. During this period, Christianity was established and there was a flowering of literature and language. Charters and law were also established. The term Anglo-Saxon is popularly used for the language that was spoken and written by the Anglo-Saxons in England and eastern Scotland between at least the mid-5th century and the mid-12th century. In scholarly use, it is more commonly called Old English. The history of the Anglo-Saxons is the history of a cultural identity. It developed from divergent groups in association with the people's adoption of Christianity, and was integral to the establishment of various kingdoms. Threatened by extended Danish invasions and military occupation of eastern England, this identity was re-established; it dominated until after the Norman Conquest. The visible Anglo-Saxon culture can be seen in the material culture of buildings, dress styles, illuminated texts and grave goods. Behind the symbolic nature of these cultural emblems, there are strong elements of tribal and lordship ties. The elite declared themselves as kings who developed burhs, and identified their roles and peoples in Biblical terms. Above all, as Helena Hamerow has observed, "local and extended kin groups remained...the essential unit of production throughout the Anglo-Saxon period." The effects persist in the 21st century as, according to a study published in March 2015, the genetic makeup of British populations today shows divisions of the tribal political units of the early Anglo-Saxon period. Use of the term Anglo-Saxon assumes that the words Angles, Saxons or Anglo-Saxon have the same meaning in all the sources. This term began to be used only in the 8th century to distinguish "Germanic" groups in Britain from those on the continent (Old Saxony in Northern Germany). [a] Catherine Hills summarised the views of many modern scholars in her observation that attitudes towards Anglo-Saxons, and hence the interpretation of their culture and history, have been "more contingent on contemporary political and religious theology as on any kind of evidence." ✪ Who were the Anglo-Saxons? The Old English ethnonym "Angul-Seaxan" comes from the Latin Angli-Saxones and became the name of the peoples Bede calls Anglorum and Gildas calls Saxones. Anglo-Saxon is a term that was rarely used by Anglo-Saxons themselves; it is not an autonym. It is likely they identified as ængli, Seaxe or, more probably, a local or tribal name such as Mierce, Cantie, Gewisse, Westseaxe, or Norþanhymbre. Also, the use of Anglo-Saxon disguises the extent to which people identified as Anglo-Scandinavian after the Viking age, or as Anglo-Norman after the Norman conquest in 1066. The earliest historical references using this term are from outside Britain, referring to piratical Germanic raiders, 'Saxones' who attacked the shores of Britain and Gaul in the 3rd century AD. Procopius states that Britain was settled by three races: the Angiloi, Frisones, and Britons. The term Angli Saxones seems to have first been used in continental writing of the 8th century; Paul the Deacon uses it to distinguish the English Saxons from the continental Saxons (Ealdseaxe, literally, 'old Saxons'). The name therefore seemed to mean "English" Saxons. The Christian church seems to have used the word Angli; for example in the story of Pope Gregory I and his remark, "Non Angli sed angeli" (not English but angels). The terms ænglisc ('the language') and Angelcynn ('the people') were also used by West Saxon King Alfred to refer to the people; in doing so he was following established practice. The first use of the term Anglo-Saxon amongst the insular sources is in the titles for Athelstan: Angelsaxonum Denorumque gloriosissimus rex (most glorious king of the Anglo-Saxons and of the Danes) and rex Angulsexna and Norþhymbra imperator paganorum gubernator Brittanorumque propugnator (king of the Anglo-Saxons and emperor of the Northumbrians, governor of the pagans, and defender of the Britons). At other times he uses the term rex Anglorum (king of the English), which presumably meant both Anglo-Saxons and Danes. Alfred the Great used Anglosaxonum Rex. The term Engla cyningc (King of the English) is used by Æthelred. King Cnut in 1021 was the first to refer to the land and not the people with this term: ealles Englalandes cyningc (King of all England). These titles express the sense that the Anglo-Saxons were a Christian people with a king anointed by God. The indigenous Common Brittonic speakers referred to Anglo-Saxons as Saxones or possibly Saeson (the word Saeson is the modern Welsh word for 'English people'); the equivalent word in Scottish Gaelic is Sasannach and in the Irish language, Sasanach. Catherine Hills suggests that it is no accident, "that the English call themselves by the name sanctified by the Church, as that of a people chosen by God, whereas their enemies use the name originally applied to piratical raiders". By the year 400, southern Britain – that is Britain below Hadrian's Wall – was a peripheral part of the western Roman Empire, occasionally lost to rebellion or invasion, but until then always eventually recovered. Around 410, Britain slipped beyond direct imperial control into a phase which has generally been termed "sub-Roman". Writing c. 540 Gildas mentions that, sometime in the 5th century, a council of leaders in Britain agreed that some land in the east of southern Britain would be given to the Saxons on the basis of a treaty, a foedus, by which the Saxons would defend the Britons against attacks from the Picts and Scoti in exchange for food supplies. The most contemporaneous textual evidence is the Chronica Gallica of 452 which records for the year 441: "The British provinces, which to this time had suffered various defeats and misfortunes, are reduced to Saxon rule." This is an earlier date than that of 451 for the "coming of the Saxons" used by Bede in his Historia ecclesiastica gentis Anglorum, written around 731. It has been argued that Bede misinterpreted his (scanty) sources, and that the chronological references in the Historia Britonnum yield a plausible date of around 428. Gildas recounts how a war broke out between the Saxons and the local population – Higham calls it the "War of the Saxon Federates" – which ended shortly after the siege at 'Mons Badonicus'. The Saxons go back to "their eastern home". Gildas calls the peace a "grievous divorce with the barbarians". The price of peace, Nick Higham argues, is a better treaty for the Saxons, giving them the ability to receive tribute from people across the lowlands of Britain. The archaeological evidence agrees with this earlier timescale. In particular, the work of Catherine Hills and Sam Lucy on the evidence of Spong Hill has moved the chronology for the settlement earlier than 450, with a significant number of items now in phases before Bede's date. The Tribal Hidage lists thirty-five peoples, or tribes, with assessments in hides, which may have originally been defined as the area of land sufficient to maintain one family. The assessments in the Hidage reflect the relative size of the provinces. Although varying in size, all thirty-five peoples of the Tribal Hidage were of the same status, in that they were areas which were ruled by their own elite family (or royal houses), and so were assessed independently for payment of tribute. [d] By the end of the sixth century, larger kingdoms had become established on the south or east coasts. They include the provinces of the Jutes of Hampshire and Wight, the South Saxons, Kent, the East Saxons, East Angles, Lindsey and (north of the Humber) Deira and Bernicia. Several of these kingdoms may have had as their initial focus a territory based on a former Roman civitas. In 565, Columba, a monk from Ireland who studied at the monastic school of Moville under St. Finnian, reached Iona as a self-imposed exile. The influence of the monastery of Iona would grow into what Peter Brown has described as an "unusually extensive spiritual empire," which "stretched from western Scotland deep to the southwest into the heart of Ireland and, to the southeast, it reached down throughout northern Britain, through the influence of its sister monastery Lindisfarne." In June 597 Columba died. At this time, Augustine landed on the Isle of Thanet and proceeded to King Æthelberht's main town of Canterbury. He had been the prior of a monastery in Rome when Pope Gregory the Great chose him in 595 to lead the Gregorian mission to Britain to Christianise the Kingdom of Kent from their native Anglo-Saxon paganism. Kent was probably chosen because Æthelberht had married a Christian princess, Bertha, daughter of Charibert I the King of Paris, who was expected to exert some influence over her husband. Æthelberht was converted to Christianity, churches were established, and wider-scale conversion to Christianity began in the kingdom. Æthelberht's law for Kent, the earliest written code in any Germanic language, instituted a complex system of fines. Kent was rich, with strong trade ties to the continent, and Æthelberht may have instituted royal control over trade. For the first time following the Anglo-Saxon invasion, coins began circulating in Kent during his reign. In 635 Aidan, an Irish monk from Iona, chose the Isle of Lindisfarne to establish a monastery which was close to King Oswald's main fortress of Bamburgh. He had been at the monastery in Iona when Oswald asked to be sent a mission to Christianise the Kingdom of Northumbria from their native Anglo-Saxon paganism. Oswald had probably chosen Iona because after his father had been killed he had fled into south-west Scotland and had encountered Christianity, and had returned determined to make Northumbria Christian. Aidan achieved great success in spreading the Christian faith, and since Aidan could not speak English and Oswald had learned Irish during his exile, Oswald acted as Aidan's interpreter when the latter was preaching. Later, Northumberland's patron saint, Saint Cuthbert, was an abbot of the monastery, and then Bishop of Lindisfarne. An anonymous life of Cuthbert written at Lindisfarne is the oldest extant piece of English historical writing, [e] and in his memory a gospel (known as the St Cuthbert Gospel) was placed in his coffin. The decorated leather bookbinding is the oldest intact European binding. In 664, the Synod of Whitby was convened and established Roman practice as opposed to Irish practice (in style of tonsure and dates of Easter) as the norm in Northumbria, and thus "brought the Northumbrian church into the mainstream of Roman culture." The episcopal seat of Northumbria was transferred from Lindisfarne to York. Wilfrid, chief advocate for the Roman position, later became Bishop of Northumbria, while Colmán and the Ionan supporters, who did not change their practices, withdrew to Iona. By 660 the political map of Lowland Britain had developed with smaller territories coalescing into kingdoms, and from this time larger kingdoms started dominating the smaller kingdoms. The development of kingdoms, with a particular king being recognised as an overlord, developed out of an early loose structure that, Higham believes, is linked back to the original feodus. The traditional name for this period is the Heptarchy, which has not been used by scholars since the early 20th century as it gives the impression of a single political structure and does not afford the "opportunity to treat the history of any one kingdom as a whole". Simon Keynes suggests that the 8th and 9th century was period of economic and social flourishing which created stability both below the Thames and above the Humber. Many areas flourished and their influence was felt across the continent, however in between the Humber and Thames, one political entity grew in influence and power and to the East these developments in Britain attracted attention. Middle-lowland Britain was known as the place of the Mierce, the border or frontier folk, in Latin Mercia. Mercia was a diverse area of tribal groups, as shown by the Tribal Hidage; the peoples were a mixture of Brythonic speaking peoples and "Anglo-Saxon" pioneers and their early leaders had Brythonic names, such as Penda. Although Penda does not appear in Bede's list of great overlords it would appear from what Bede says elsewhere that he was dominant over the southern kingdoms. At the time of the battle of the river Winwæd, thirty duces regii (royal generals) fought on his behalf. Although there are many gaps in the evidence, it is clear that the seventh-century Mercian kings were formidable rulers who were able to exercise a wide-ranging overlordship from their Midland base. Mercian military success was the basis of their power; it succeeded against not only 106 kings and kingdoms by winning set-piece battles, but by ruthlessly ravaging any area foolish enough to withhold tribute. There are a number of casual references scattered throughout the Bede's history to this aspect of Mercian military policy. Penda is found ravaging Northumbria as far north as Bamburgh and only a miraculous intervention from Aidan prevents the complete destruction of the settlement. In 676 Æthelred conducted a similar ravaging in Kent and caused such damage in the Rochester diocese that two successive bishops gave up their position because of lack of funds. In these accounts there is a rare glimpse of the realities of early Anglo-Saxon overlordship and how a widespread overlordship could be established in a relatively short period. By the middle of the 8th century, other kingdoms of southern Britain were also affected by Mercian expansionism. The East Saxons seem to have lost control of London, Middlesex and Hertfordshire to Æthelbald, although the East Saxon homelands do not seem to have been affected, and the East Saxon dynasty continued into the ninth century. The Mercian influence and reputation reached its peak when, in the late 8th century, the most powerful European ruler of the age, the Frankish king Charlemagne, recognised the Mercian King Offa's power and accordingly treated him with respect, even if this could have been just flattery. Michael Drout calls this period the "Golden Age", when learning flourishes with a renaissance in classical knowledge. The growth and popularity of monasticism was not an entirely internal development, with influence from the continent shaping Anglo-Saxon monastic life. In 669 Theodore, a Greek-speaking monk originally from Tarsus in Asia Minor, arrived in Britain to become the eighth Archbishop of Canterbury. He was joined the following year by his colleague Hadrian, a Latin-speaking African by origin and former abbot of a monastery in Campania (near Naples). One of their first tasks at Canterbury was the establishment of a school; and according to Bede (writing some sixty years later), they soon "attracted a crowd of students into whose minds they daily poured the streams of wholesome learning". As evidence of their teaching, Bede reports that some of their students, who survived to his own day were as fluent in Greek and Latin as in their native language. Bede does not mention Aldhelm in this connection; but we know from a letter addressed by Aldhelm to Hadrian that he too must be numbered among their students. The Oseberg ship prow, Viking Ship Museum, Oslo, Norway. The 9th century saw the rise of Wessex, from the foundations laid by King Egbert in the first quarter of the century to the achievements of King Alfred the Great in its closing decades. The outlines of the story are told in the Anglo-Saxon Chronicle, though the annals represent a West Saxon point of view. On the day of Egbert's succession to the kingdom of Wessex, in 802, a Mercian ealdorman from the province of the Hwicce had crossed the border at Kempsford, with the intention of mounting a raid into northern Wiltshire; the Mercian force was met by the local ealdorman, "and the people of Wiltshire had the victory". In 829 Egbert went on, the chronicler reports, to conquer "the kingdom of the Mercians and everything south of the Humber". It was at this point that the chronicler chose to attach Egbert's name to Bede's list of seven overlords, adding that "he was the eighth king who was Bretwalda". Simon Keynes suggests Egbert's foundation of a 'bipartite' kingdom is crucial as it stretched across southern England, and it created a working alliance between the West Saxon dynasty and the rulers of the Mercians. In 860 the eastern and western parts of the southern kingdom were united by agreement between the surviving sons of King Æthelwulf, though the union was not maintained without some opposition from within the dynasty; and in the late 870s King Alfred gained the submission of the Mercians under their ruler Æthelred, who in other circumstances might have been styled a king, but who under the Alfredian regime was regarded as the 'ealdorman' of his people. Viking raids continued until in 850, then the Chronicle says: "The heathen for the first time remained over the winter". The fleet does not appear to have stayed long in England, but it started a trend which others subsequently followed. In particular, the army which arrived in 865 remained over many winters, and part of it later settled what became known as the Danelaw. This was the "Great Army", a term used by the Chronicle in England and by Adrevald of Fleury on the Continent. The invaders were able not only to exploit the feuds between and within the various kingdoms, but to appoint puppet kings, Ceolwulf in Mercia in 873, 'a foolish king's thane' (ASC), and perhaps others in Northumbria in 867 and East Anglia in 870. The third phase was an era of settlement; however, the 'Great Army' went wherever it could find the richest pickings, crossing the Channel when faced with resolute opposition, as in England in 878, or with famine, as on the Continent in 892. By this stage the Vikings were assuming ever increasing importance as catalysts of social and political change. They constituted the common enemy, making the English the more conscious of a national identity which overrode deeper distinctions; they could be perceived as an instrument of divine punishment for the people's sins, raising awareness of a collective Christian identity; and by 'conquering' the kingdoms of the East Angles, the Northumbrians and the Mercians they created a vacuum in the leadership of the English people. What is presumed to be one of these "æstel" (the word only appears in this one text) is the gold, rock crystal and enamel Alfred Jewel, discovered in 1693, which is assumed to have been fitted with a small rod and used as a pointer when reading. Alfred provided functional patronage, linked to a social programme of vernacular literacy in England, which was unprecedented. Silver brooch imitating a coin of Edward the Elder, c. 920, found in Rome, Italy. British Museum. During the course of the 10th century, the West Saxon kings extended their power first over Mercia, then into the southern Danelaw, and finally over Northumbria, thereby imposing a semblance of political unity on peoples, who nonetheless would remain conscious of their respective customs and their separate pasts. The prestige, and indeed the pretensions, of the monarchy increased, the institutions of government strengthened, and kings and their agents sought in various ways to establish social order. This process started with Edward the Elder – who with his sister, Æthelflæd, Lady of the Mercians, initially, charters reveal, encouraged people to purchase estates from the Danes, thereby to reassert some degree of English influence in territory which had fallen under Danish control. David Dumville suggests that Edward may have extended this policy by rewarding his supporters with grants of land in the territories newly conquered from the Danes, and that any charters issued in respect of such grants have not survived. When Athelflæd died, Mercia was absorbed by Wessex. From that point on there was no contest for the throne, so the house of Wessex became the ruling house of England. Edward the Elder was succeeded by his son Æthelstan, who Simon Keynes calls the "towering figure in the landscape of the tenth century". His victory over a coalition of his enemies – Constantine, King of the Scots, Owain ap Dyfnwal, King of the Cumbrians, and Olaf Guthfrithson, King of Dublin – at the battle of Brunanburh, celebrated by a famous poem in the Anglo-Saxon Chronicle, opened the way for him to be hailed as the first king of England. Æthelstan's legislation shows how the king drove his officials to do their respective duties. He was uncompromising in his insistence on respect for the law. However this legislation also reveals the persistent difficulties which confronted the king and his councillors in bringing a troublesome people under some form of control. His claim to be "king of the English" was by no means widely recognised. The situation was complex: the Hiberno-Norse rulers of Dublin still coveted their interests in the Danish kingdom of York; terms had to be made with the Scots, who had the capacity not merely to interfere in Northumbrian affairs, but also to block a line of communication between Dublin and York; and the inhabitants of northern Northumbria were considered a law unto themselves. It was only after twenty years of crucial developments following Æthelstan's death in 939 that a unified kingdom of England began to assume its familiar shape. However, the major political problem for Edmund and Eadred, who succeeded Æthelstan, remained the difficulty of subjugating the north. In 959 Edgar is said to have "succeeded to the kingdom both in Wessex and in Mercia and in Northumbria, and he was then 16 years old" (ASC, version 'B', 'C'), and is called "the Peacemaker". By the early 970s, after a decade of Edgar's 'peace', it may have seemed that the kingdom of England was indeed made whole. In his formal address to the gathering at Winchester the king urged his bishops, abbots and abbesses "to be of one mind as regards monastic usage . . . lest differing ways of observing the customs of one Rule and one country should bring their holy conversation into disrepute". The reign of King Æthelred the Unready witnessed the resumption of Viking raids on England, putting the country and its leadership under strains as severe as they were long sustained. Raids began on a relatively small scale in the 980s, but became far more serious in the 990s, and brought the people to their knees in 1009–12, when a large part of the country was devastated by the army of Thorkell the Tall. It remained for Swein Forkbeard, king of Denmark, to conquer the kingdom of England in 1013–14, and (after Æthelred's restoration) for his son Cnut to achieve the same in 1015–16. The tale of these years incorporated in the Anglo-Saxon Chronicle must be read in its own right, and set beside other material which reflects in one way or another on the conduct of government and warfare during Æthelred's reign. It is this evidence which is the basis for Simon Keynes's view that the king lacked the strength, judgement and resolve to give adequate leadership to his people in a time of grave national crisis; who soon found out that he could rely on little but the treachery of his military commanders; and who, throughout his reign, tasted nothing but the ignominy of defeat. The raids exposed tensions and weaknesses which went deep into the fabric of the late Anglo-Saxon state and it is apparent that events proceeded against a background more complex than the chronicler probably knew. It seems, for example, that the death of Bishop Æthelwold in 984 had precipitated further reaction against certain ecclesiastical interests; that by 993 the king had come to regret the error of his ways, leading to a period when the internal affairs of the kingdom appear to have prospered. In April 1016 Æthelred died of illness, leaving his son and successor Edmund Ironside to defend the country. The final struggles were complicated by internal dissension, and especially by the treacherous acts of Ealdorman Eadric of Mercia, who opportunistically changed sides to Cnut's party. After the defeat of the English in the battle of Assandun in October 1016, Edmund and Cnut agreed to divide the kingdom so that Edmund would rule Wessex and Cnut Mercia, but Edmund died soon after his defeat in November 1016, making it possible for Cnut to seize power over all England. In the 11th century, there were three conquests and some Anglo-Saxon people would live through it: one in the aftermath of the conquest of Cnut in 1016; the second after the unsuccessful attempt of battle of Stamford Bridge in 1066; the third after that of William of Normandy in 1066. The consequences of each conquest can only be assessed with hindsight. In 1016, no-one was to know that whatever cultural ramifications were felt then, they would be subsumed half a century later; and in 1066 there was nothing to predict that the effects of William's conquest would be any greater or more lasting than those of Cnut's. Edward became king in 1042, and given his upbringing might have been considered a Norman by those who lived across the English Channel. Following Cnut's reforms, excessive power was concentrated in the hands of the rival houses of Leofric of Mercia and Godwine of Wessex. Problems also came for Edward from the resentment caused by the king's introduction of Norman friends. A crisis arose in 1051 when Godwine defied the king's order to punish the men of Dover, who had resisted an attempt by Eustace of Boulogne to quarter his men on them by force. The support of Earl Leofric and Earl Siward enabled Edward to secure the outlawry of Godwine and his sons; and William of Normandy paid Edward a visit during which Edward may have promised William succession to the English throne, although this Norman claim may have been mere propaganda. Godwine and his sons came back the following year with a strong force, and the magnates were not prepared to engage them in civil war but forced the king to make terms. Some unpopular Normans were driven out, including Archbishop Robert, whose archbishopric was given to Stigand; this act supplied an excuse for the Papal support of William's cause. Following the conquest, the Anglo-Saxon nobility were either exiled or joined the ranks of the peasantry. It has been estimated that only about 8 per cent of the land was under Anglo-Saxon control by 1087. Many Anglo-Saxon nobles fled to Scotland, Ireland, and Scandinavia. The Byzantine Empire became a popular destination for many Anglo-Saxon soldiers, as it was in need of mercenaries. The Anglo-Saxons became the predominant element in the elite Varangian Guard, hitherto a largely North Germanic unit, from which the emperor's bodyguard was drawn and continued to serve the empire until the early 15th century. However, the population of England at home remained largely Anglo-Saxon; for them, little changed immediately except that their Anglo-Saxon lord was replaced by a Norman lord. The chronicler Orderic Vitalis (1075 – c. 1142), himself the product of an Anglo-Norman marriage, wrote: "And so the English groaned aloud for their lost liberty and plotted ceaselessly to find some way of shaking off a yoke that was so intolerable and unaccustomed". The inhabitants of the North and Scotland never warmed to the Normans following the Harrying of the North (1069–1070), where William, according to the Anglo Saxon Chronicle utterly "ravaged and laid waste that shire". Many Anglo-Saxon people needed to learn Norman French to communicate with their rulers, but it is clear that among themselves they kept speaking Old English, which meant that England was in an interesting tri-lingual situation: Anglo-Saxon for the common people, Latin for the Church, and Norman French for the administrators, the nobility, and the law courts. In this time, and due to the cultural shock of the Conquest, Anglo-Saxon began to change very rapidly, and by 1200 or so, it was no longer Anglo-Saxon English, but what scholars call early Middle English. But this language had deep roots in Anglo-Saxon, which was being spoken a lot later than 1066. Research in the early twentieth century, and still continuing today, has shown that a form of Anglo-Saxon was still being spoken, and not merely among uneducated peasants, into the thirteenth century in the West Midlands. This was J.R.R. Tolkien's major scholarly discovery when he studied a group of texts written in early Middle English called the Katherine Group, because they include the Life of St. Katherine (also, the Life of St. Margaret, the Life and the Passion of St. Juliana, Ancrene Wisse, and Hali Meithhad—these last two teaching how to be a good anchoress and arguing for the goodness of virginity). Tolkien noticed that a subtle distinction preserved in these texts indicated that Old English had continued to be spoken far longer than anyone had supposed. In Old English there is a distinction between two different kinds of verbs. The Germanic language spoken by the Anglo-Saxons, Old English, had always been a central mark of their cultural identity. With the passing of time, however, and particularly following the Norman conquest of England, this language changed significantly, and although some people (for example the famous scribe known as the Tremulous Hand of Worcester) could still read Old English in the thirteenth century, it soon became impossible for people to read Old English, and the texts became useless. The precious Exeter Book, for example, seems to have been used to press gold leaf and at one point had a pot of fish-based glue sitting on top of it. For Michael Drout this symbolises the end of the Anglo-Saxons. The development of Anglo-Saxon kingship is little understood but the model proposed by Yorke, considered the development of kingdoms and writing down of the oral law-codes to be linked to a progression towards leaders providing mund and receiving recognition. These leaders who developed in the sixth century, were able to seize the initiative and to establish a position of power for themselves and their successors. Anglo-Saxon leaders, unable to tax and coerce followers instead extracted surplus by raiding and collecting food renders and 'prestige goods'. The later sixth century saw the end of a 'prestige goods' economy, as evidenced by the decline of accompanied burial, and the appearance of the first princely graves and high-status settlements. These centres of trade and production reflect the increased socio-political stratification and wider territorial authority which allowed seventh-century elites to extract and redistribute surpluses with far greater effectiveness than their sixth-century predecessors would have found possible. Anglo-Saxon society, in short, looked very different in 600 than it did a hundred years earlier. The right half of the front panel of the seventh century Franks Casket, depicting the pan-Germanic legend of Weyland Smith also Weyland The Smith, which was apparently also a part of Anglo-Saxon pagan mythology. Early Anglo-Saxon society attached great significance to the horse; a horse may have been an acquaintance of the god Wodan, and/or they may have been (according to Tacitus) confidants of the gods. Horses were closely associated with gods, especially Odin and Freyr. Horses played a central role in funerary practices as well as in other rituals. Horses were prominent symbols of fertility, and there were many horse fertility cults. The rituals associated with these include horse fights, burials, consumption of horse meat, and horse sacrifice. Hengist and Horsa, the mythical ancestors of the Anglo-Saxons, were associated with horses, and references to horses are found throughout Anglo-Saxon literature. Actual horse burials in England are relatively rare and "may point to influence from the continent". A well-known Anglo-Saxon horse burial (from the sixth/seventh century) is Mound 17 at Sutton Hoo, a few yards from the more famous ship burial in Mound 1. A sixth-century grave near Lakenheath, Suffolk, yielded the body of a man next to that of a "complete horse in harness, with a bucket of food by its head." Pagan Anglo-Saxons worshipped at a variety of different sites across their landscape, some of which were apparently specially built temples and others that were natural geographical features such as sacred trees, hilltops or wells. According to place name evidence, these sites of worship were known alternately as either hearg or as wēoh. Almost no poem from before the Norman Conquest, no matter how Christian its theme, is not steeped in pagan symbolism and their integration into the new faith goes beyond the literary sources. Thus, as Lethbridge reminds us, "to say, 'this is a monument erected in Christian times and therefore the symbolism on it must be Christian,' is an unrealistic approach. The rites of the older faith, now regarded as superstition, are practised all over the country today. It did not mean that people were not Christian; but that they could see a lot of sense in the old beliefs also"
Bede's story of Cædmon, the cowherd who became the 'Father of English Poetry' represents the real heart of the conversion of the Anglo-Saxons from paganism to Christianity. Bede wrote, "[t]here was in the Monastery of this Abbess (Streonæshalch – now known as Whitby Abbey) a certain brother particularly remarkable for the Grace of God, who was wont to make religious verses, so that whatever was interpreted to him out of scripture, he soon after put the same into poetical expressions of much sweetness and humility in Old English, which was his native language. By his verse the minds of many were often excited to despise the world, and to aspire to heaven." The story of Cædmon illustrates the blending of Christian and Germanic, Latin and oral tradition, monasteries and double monasteries, pre-existing customs and new learning, popular and elite, that characterizes the Conversion period of Anglo-Saxon history and culture. Cædmon does not destroy or ignore traditional Anglo-Saxon poetry. Instead, he converts it into something that helps the Church. Anglo-Saxon England finds ways to synthesize the religion of the Church with the existing "northern" customs and practices. Thus the conversion of the Anglo-Saxons was not just their switching from one practice to another, but making something new out of their old inheritance and their new belief and learning. The second element of Alfred's society is fighting men. The subject of war and the Anglo-Saxons is a curiously neglected one[citation needed], however, it is an important element of the Anglo-Saxon society. The third aspect of Alfred's society is the working man. Helena Hamerow suggest the prevailing model of working life and settlement, particularly for the early period, as one of shifting settlement and building tribal kinship. The mid-Saxon period saw diversification, the development of enclosures, the beginning of the toft system, closer management of livestock, the gradual spread of the mould-board plough, 'informally regular plots' and a greater permanence, with further settlement consolidation thereafter foreshadowing post-Conquest villages. The later periods saw a proliferation of 'service features' including barns, mills and latrines, most markedly on high-status sites. Throughout the Anglo-Saxon period as Helena Hamerow suggests: "local and extended kin groups remained...the essential unit of production". This is very noticeable in the early period. However, by the tenth and eleventh centuries, the rise of the manor and its significance in terms of both settlement and the management of land, which becomes very evident in the Domesday Book. The collection of buildings discovered at Yeavering, formed part of an Anglo-Saxon royal vill or king's tun. These 'tun' consisted of a series of buildings designed to provide short-term accommodation for the king and his household. It is thought that the king would have travelled throughout his land dispensing justice and authority and collecting rents from his various estates. Such visits would be periodic and it is likely that he would visit each royal villa only once or twice a year. The Latin term villa regia which Bede used of the site suggests an estate centre as the functional heart of a territory held in the King's demesne. The territory is the land whose surplus production is taken into the centre as food-render to support the king and his retinue on their periodic visits as part of a progress around the kingdom. This territorial model, known as a multiple estate or shire has been developed in a range of studies and Colm O'Brien, in applying this to Yeavering has proposed a geographical definition of the wider shire of Yeavering and also a geographical definition of the principal estate whose structures Hope-Taylor excavated. One characteristic that the king's tun shared with some other groups of places is that it was a point of public assembly. People came together not only to give the king and his entourage board and lodging; they 'attended upon the king' in order to have disputes settled, cases appealed, lands granted, gifts given, appointments made, laws promulgated, policy debated, and ambassadors heard and replied to. People also assembled for other reasons, such as to hold fairs and to trade. A certain amount of social mobility is implied by regulations detailing the conditions under which a ceorl could become a thegn. Again these would have been subject to local variation, but one text refers to the possession of five hides of land (around 600 acres), a bell and a castle-gate, a seat and a special office in the king's hall. In the context of the control of boroughs, Frank Stenton noted that, according to an 11th-century source, "a merchant who had carried out three voyages at his own charge [had also been] regarded as of thegnly status." Loss of status could also occur, as with penal slavery, which could be imposed not only on the perpetrator of a crime but on his wife and family. Some slaves may have been members of the native British population conquered by the Anglo-Saxons when they arrived from the continent; others may have been captured in wars between the early kingdoms, or have sold themselves for food in times of famine. However, slavery was not always permanent, and slaves who had gained their freedom would become part of an underclass of freedmen below the rank of ceorl. The building of churches in Anglo-Saxon England essentially began with Augustine of Canterbury in Kent following 597; for this he probably imported workmen from Frankish Gaul. The cathedral and abbey in Canterbury, together with churches in Kent at Minster in Sheppey (c.664) and Reculver (669), and in Essex at the Chapel of St Peter-on-the-Wall at Bradwell-on-Sea, define the earliest type in southeast England. A simple nave without aisles provided the setting for the main altar; east of this a chancel arch separated off the apse for use by the clergy. Flanking the apse and east end of the nave were side chambers serving as sacristies; further porticus might continue along the nave to provide for burials and other purposes. In Northumbria the early development of Christianity was influenced by the Irish mission, important churches being built in timber. Masonry churches became prominent from the late 7th century with the foundations of Wilfrid at Ripon and Hexham, and of Benedict Biscop at Monkwearmouth-Jarrow. These buildings had long naves and small rectangular chancels; porticus sometimes surrounded the naves. Elaborate crypts are a feature of Wilfrid's buildings. The best preserved early Northumbrian church is Escomb Church. From the mid-8th century to the mid-10th a number of important buildings survive. One group comprises the first evidenced aisled churches: Brixworth, the most ambitious Anglo-Saxon church to survive largely intact, Wareham St Mary's, and Cirencester; also the rebuilding of Canterbury Cathedral. These buildings may be compared with aisled churches in the Carolingian empire. Other lesser churches may be dated to the late eighth and early ninth centuries on the basis of their elaborate sculptured decoration and have simple naves with side porticus. The tower of Barnack (near Peterborough) takes the picture forward to the West Saxon reconquest in the early 10th century, when decorative features that were to be characteristic of Late Anglo-Saxon architecture were already developed, such as narrow raised bands of stone ('pilaster strips') to surround archways and to articulate wall surfaces, as at Barton-upon-Humber and Earls Barton. In plan, however, the churches remained essentially conservative. From, the monastic revival of the second half of the tenth century only a few documented buildings survive or have been excavated, for example: the abbeys of Glastonbury; Old Minster, Winchester; Romsey; Cholsey; and Peterborough Cathedral. The majority of churches that have been described as Anglo-Saxon fall into the period between the late 10th century and the early 12th. During this period many settlements were first provided with stone churches, but timber also continued to be used; the best wooden survival is Greensted Church in Essex, no earlier than the 9th century, and no doubt typical of many parish churches. On the Continent during the eleventh century was developed a group of interrelated Romanesque styles, associated with the rebuilding of many churches on a grand scale, made possible by a general advance in architectural technology and mason-craft. The first fully Romanesque church in England was Edward the Confessor's rebuilding of Westminster Abbey (c.1050s and following), while the main development of the style only followed the Norman Conquest. However, at Stow Minster the crossing piers of the early 1050s are clearly 'proto-Romanesque'. A more decorative interpretation of Romanesque in lesser churches can be dated only somewhere between the mid and late 11th century, e.g. Hadstock (Essex), Clayton and Sompting (Sussex); this style continued towards the end of the century as at Milborne Port (Somerset). At St Augustine's Abbey in Canterbury c.1048–61 Abbot Wulfric aimed to retain the earlier churches while linking them with an octagonal rotunda: but the concept was still essentially Pre-Romanesque. Anglo-Saxon churches of all periods would have been embellished with a range of arts, including wall-paintings, some stained glass, metalwork and statues. Early Anglo-Saxon art, as it survives, is seen mostly in decorated jewellery, like brooches, buckles, beads and wrist-clasps, some of outstanding quality. Characteristic of the 5th century is the quoit brooch with motifs based on crouching animals, as seen on the silver quoit brooch from Sarre, Kent. While the origins of this style are disputed, it is either an offshoot of provincial Roman art, Frank, or Jute art. One style flourished from the late 5th century, and continued throughout the 6th, and is on many square-headed brooches, it is characterised by chip-carved patterns based on animals and masks. A different style, which gradually superseded it is dominated by serpentine beasts with interlacing bodies. By the later 6th century the best works from the south-east are distinguished by greater use of expensive materials, above all gold and garnets, reflecting the growing prosperity of a more organised society which had greater access to imported precious materials, as seen in the buckle from the Taplow burial and the jewellery from that at Sutton Hoo, c.600 and c.625 respectively. The possible symbolism of the decorative elements like interlace and beast forms that were used in these early works remains unclear, it is clear. These objects were the products of a society that invested its modest surpluses in personal display, who fostered craftsmen and jewellers of a high standard, and a society where the possession of a fine brooch or buckle was a valuable status symbol and possible tribal emblem – in death as much as in life. The Staffordshire Hoard is the largest hoard of Anglo-Saxon gold and silver metalwork yet found[update]. Discovered in a field near the village of Hammerwich, near Lichfield, in Staffordshire, England, it consists of over 3,500 items that are nearly all martial in character and contains no objects specific to female uses. It demonstrates that considerable quantities of high-grade goldsmiths' work were in circulation among the elite during the 7th century. It also shows that, superb though individual pieces may be in terms of craftsmanship, the value of such items as currency and their potential roles as tribute or the spoils of war could, in a warrior society, outweigh appreciation of their integrity and artistry. The coming of Christianity revolutionised the visual arts, as well as other aspects of society. Art had to fulfil new functions, and whereas pagan art was abstract, Christianity required images clearly representing subjects. The transition between the Christian and pagan traditions is occasionally apparent in 7th century works; examples include the Crundale buckle and the Canterbury pendant. In addition to fostering metalworking skills, Christianity stimulated stone sculpture and manuscript illumination. In these Germanic motifs, such as interlace and animal ornament along with Celtic spiral patterns, are juxtaposed with Christian imagery and Mediterranean decoration, notably vine-scroll. The Ruthwell Cross, Bewcastle Cross and Easby Cross are leading Northumbrian examples of the Anglo-Saxon version of the Celtic high cross, generally with a slimmer shaft. The jamb of the doorway at Monkwearmouth, carved with a pair of lacertine beasts, probably dates from the 680s; the golden, garnet-adorned pectoral cross of St Cuthbert was presumably made before 687; while his wooden inner coffin (incised with Christ and the Evangelists' symbols, the Virgin and Child, archangels and apostles), the Lindisfarne Gospels, and the Codex Amiatinus all date from c.700. The fact that these works are all from Northumbria might be held to reflect the particular strength of the church in that kingdom during the second half of the century. Works from the south were more restrained in their ornamentation than are those from Northumbria. Lindisfarne was a very important centre of book production, along with Ripon and Monkwearmouth-Jarrow. The Lindisfarne Gospels might be the single most beautiful book produced in the Middle Ages, and the Echternach Gospels and (probably) the Book of Durrow are other products of Lindisfarne. A Latin gospel book, the Lindisfarne Gospels are richly illuminated and decorated in an Insular style that blends not only Irish and Western Mediterranean elements but, incorporates imagery from the Eastern Mediterranean, including Coptic Christianity as well. Produced in the north of England at the same time was the Codex Amiatinus, which has been called "the finest book in the world." It is certainly one of the largest, weighing 34 kilograms. It is a pandect, which was rare in the Middle Ages: all the books of the Bible in one volume. The Codex Amiatinus was produced at Monkwearmouth-Jarrow in 692 under the direction of Abbot Ceolfrith. Bede probably had something to do with it. The production of the Codex shows the riches of the north of England at this time. We have records of the monastery needing a new grant of land to raise two thousand more cattle to get the calf skins to make the vellum to make the manuscript. The Codex Amiatinus was meant to be a gift to the Pope, and Ceolfrith was taking it to Rome when he died on the way. The copy ended up in Florence, where it still is today – a ninth-century copy of this book is even today the personal Bible of the Pope. In the 8th century, Anglo-Saxon Christian art flourished with grand decorated manuscripts and sculptures, along with 'secular' works which bear comparable ornament, like the Witham pins and the Coppergate helmet. The flourishing of sculpture in Mercia, occurred slightly later than in Northumbria and is dated to the second half of the 8th century. Some fine decorated southern books, above all the Bible fragment, can be securely assigned to the earlier 9th century, owing to the similarity of their script to that of charters from that period; The Book of Cerne is an early 9th century Insular or Anglo-Saxon Latin personal prayer book with Old English components. This manuscript was decorated and embellished with four painted full-page miniatures, major and minor letters, continuing panels, and litterae notibiliores. Further decorated motifs used in these manuscripts, such as hunched, triangular beasts, also appear on objects from the Trewhiddle hoard (buried in the 870s) and on the rings which bear the names of King Æthelwulf and Queen Æthelswith, which are the centre of a small corpus of fine ninth-century metalwork. There was demonstrable continuity in the south, even though the Danish settlement represented a watershed in England's artistic tradition. Wars and pillaging removed or destroyed much Anglo-Saxon art, while the settlement introduced new Scandinavian craftsmen and patrons. The result was to accentuate the pre-existing distinction between the art of the north and that of the south. In the 10th and 11th centuries, the Viking dominated areas were characterised by stone sculpture in which the Anglo-Saxon tradition of cross shafts took on new forms, and a distinctive Anglo-Scandinavian monument, the 'hogback' tomb, was produced. The decorative motifs used on these northern carvings (as on items of personal adornment or everyday use) echo Scandinavian styles. The Wessexan hegemony and the monastic reform movement appear to have been the catalysts for the rebirth of art in southern England from the end of the 9th century. Here artists responded primarily to continental art; foliage supplanting interlace as the preferred decorative motif. Key early works are the Alfred Jewel, which has fleshy leaves engraved on the back plate; and the stole and maniples of Bishop Frithestan of Winchester, which are ornamented with acanthus leaves, alongside figures that bear the stamp of Byzantine art. The surviving evidence points to Winchester and Canterbury as the leading centres of manuscript art in the second half of the 10th century: they developed colourful paintings with lavish foliate borders, and coloured line drawings. By the early 11th century, these two traditions had fused and had spread to other centres. Although manuscripts dominate the corpus, sufficient architectural sculpture, ivory carving and metalwork survives to show that the same styles were current in secular art, and became widespread in the south at parochial level. The wealth of England in the later tenth and eleventh century is clearly reflected in the lavish use of gold in manuscript art as well as for vessels, textiles and statues (now known only from descriptions). Widely admired, southern English art was highly influential in Normandy, France and Flanders from c.1000. Indeed, keen to possess it, or recover its materials, the Normans appropriated it in large quantities in the wake of the Conquest. The Bayeux Tapestry, probably designed by a Canterbury artist for Bishop Odo of Bayeux, is arguably the swansong of Anglo-Saxon art. Surveying nearly 600 years of continuous change, three common strands stand out: lavish colour and rich materials; an interplay between abstract ornament and representational subject matter; and a fusion of art styles reflects England was linked in the 11th century. Old English (Ænglisc, Anglisc, Englisc) or Anglo-Saxon is the early form of the English language that was spoken and written by the Anglo-Saxons and their descendants in parts of what are now England and southern and eastern Scotland between at least the mid-5th century and the mid-12th century. Old English is a West Germanic language closely related to Old Frisian and Old Saxon. It had a grammar similar in many ways to Classical Latin. In most respects, including its grammar, it was much closer to modern German and Icelandic than to modern English. It was fully inflected with five grammatical cases (nominative, accusative, genitive, dative, and instrumental), three grammatical numbers (singular, plural, and dual) and three grammatical genders (masculine, feminine, and neuter). The dual forms occurred in the first and second persons only and referred to groups of two. Some of the characteristics of the language were: adjectives, pronouns and (sometimes) participles that agreed with their antecedent nouns in case, number and gender; finite verbs that agreed with their subject in person and number; and nouns that came in numerous declensions (with deep parallels in Latin, Ancient Greek and Sanskrit). Verbs came in nine main conjugations (seven strong and two weak), each with numerous subtypes, as well as a few additional smaller conjugations and a handful of irregular verbs. The main difference from other ancient Indo-European languages, such as Latin, is that verbs can be conjugated in only two tenses (vs. the six "tenses" – really tense/aspect combinations – of Latin), and have no synthetic passive voice (although it did still exist in Gothic). Gender in nouns was grammatical, as opposed to the natural gender that prevails in modern English. Many linguists believe that Old English received little influence from the local insular languages, especially Common Brittonic (the language that may have been the majority language in Lowland Britain, although it's also possible that British Latin had already replaced it in this region). Linguists such as Richard Coates have suggested there could not have been meaningful contact between the languages, which is reasonable argued from the small amount of loanwords. Recently a number of linguists have argued that many of the grammar changes observed in English were due to a Brittonic influence (see Brittonicisms in English). John McWhorter suggests that the language changes seen later in English were always there in vernacular speech and this was not written, especially since those who did the writing were educated individuals that most likely spoke a standard form of Old English. The speech of an illiterate ceorl, on the other hand, can not be reconstructed. The progressive nature of this language acquisition, and the "retrospective reworking" of kinship ties to the dominant group led, ultimately, to the "myths which tied the entire society to immigration as an explanation of their origins in Britain". What survives through writing represents primarily the register of Anglo-Saxon, and this is most often in the West Saxon dialect. Little is known about the everyday spoken language of people living in the migration period. Old English is a contact language and it is hard to reconstruct the pidgin used in this period from the written language found in the West Saxon literature of some 400 years later. Two general theories are proposed regarding why people changed their language to Old English (or an early form of such): either, a person or household changed so as to serve an elite; or, a person or household changed through choice as it provided some advantage economically or legally. Over time, Old English developed into four major dialects: Northumbrian, spoken north of the river Humber; Mercian, spoken in the Midlands; Kentish, spoken in Kent in the far southeastern part of the island; and West Saxon, spoken in the southwest. All of these dialects have direct descendants in modern England, and American regional dialects also have their roots in the dialects of Old English. "Standard" Modern English (if there is such a thing), or at least modern English spelling, owes most to the Anglian dialect, since that was the dialect of London. Near the end of the Old English period the English language underwent a third foreign influence, namely the Scandinavian influence of Old Norse. In addition to a great many place names, these consist mainly of items of basic vocabulary, and words concerned with particular administrative aspects of the Danelaw (that is, the area of land under Viking control, which included extensive holdings all along the eastern coast of England and Scotland). The Scandinavians spoke Old Norse, a language related to Old English in that both derived from the same ancestral Proto-Germanic language. It is very common for the intermixing of speakers of different dialects, such as those that occur during times of political unrest, to result in a mixed language, and one theory holds that exactly such a mixture of Old Norse and Old English is thought to have accelerated the decline of case endings in Old English. The influence of Old Norse on the lexicon of the English language has been profound: responsible for such basic vocabulary items as sky, leg, the pronoun they and hundreds of other words. Helena Hamerow has made an observation that in Anglo-Saxon society "local and extended kin groups remained...the essential unit of production throughout the Anglo-Saxon period". "Local and extended kin groups" was a key aspect of Anglo-Saxon culture. Kinship fueled societal advantages, freedom and the relationships to an elite, that allowed the Anglo-Saxons' culture and language to flourish. The ties of loyalty to a lord, were to the person of a lord, not to his station; there was no real concept of patriotism or loyalty to a cause. This explains why dynasties waxed and waned so quickly, a kingdom was only as strong as its leader-king. There was no underlying administration or bureaucracy to maintain any gains beyond the lifetime of a leader. An example of this was the leadership of Rædwald of East Anglia and how the East Anglian primacy did not survive his death. Kings could not, except in exceptional circumstances, make new laws. Their role instead was to uphold and clarify previous custom and to assure his subjects that he would uphold their ancient privileges, laws, and customs. Although the person of the king as a leader could be exalted, the office of kingship was not in any sense as powerful or as invested with authority as it was to become. One of the tools kings used was to tie themselves closely to the new Christian church; through the practice of having a church leader anoint and crown the king; God and king were joined in peoples' minds. The initial page of Rochester Cathedral Library, MS A.3.5, the Textus Roffensis, which contains the only surviving copy of Æthelberht's laws. Old English literary works include genres such as epic poetry, hagiography, sermons, Bible translations, legal works, chronicles, mainly the Anglo-Saxon Chronicle, riddles and others. In all there are about 400 surviving manuscripts from the period, a significant corpus of both popular interest and specialist research. The manuscripts use a modified Roman alphabet, but Anglo-Saxon runes or futhorc are used in under 200 inscriptions on objects, sometimes mixed with Roman letters. This literature is remarkable for being in the vernacular (Old English) in the early medieval period: almost all other written literature was in Latin at this time, but due to Alfred's programme of vernacular literacy, the oral traditions of Anglo-Saxon England ended up being converted into writing and preserved. We owe much of this preservation to the monks of the tenth century, who made – at the very least – the copies of most of the literary manuscripts that still exist. Manuscripts were not common items. They were expensive and hard to make. First, cows or sheep had to be slaughtered and their skins tanned. Then people had to decide to use this leather for manuscripts rather than for any of the other things leather can be used for. The leather was then scraped, stretched, and cut into sheets, which were sewn into books. Then inks had to be made from oak galls and other ingredients, and the books had to be hand written by monks using quill pens. Every manuscript is slightly different from every other one, even if they are copies of each other, because every scribe had different handwriting and made different errors. We can sometimes identify individual scribes from their handwriting, and we can often guess where manuscripts were written because different scriptoria (centres of manuscript production) wrote in different styles of hand. There are four great poetic codices of Old English poetry (a codex is a book in modern format, as opposed to a scroll): the Junius Manuscript, the Vercelli Book, the Exeter Book, and the Nowell Codex or Beowulf Manuscript; most of the well-known lyric poems such as The Wanderer, The Seafarer, Deor and The Ruin are found in the Exeter Book, while the Vercelli Book has the Dream of the Rood, some of which is also carved on the Ruthwell Cross. 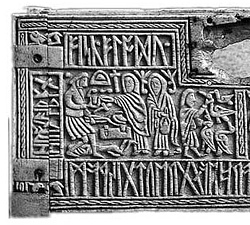 The Franks Casket also has carved riddles, a popular form with the Anglo-Saxons. Old English secular poetry is mostly characterized by a somewhat gloomy and introspective cast of mind, and the grim determination found in The Battle of Maldon, recounting an action against the Vikings in 991. This is from a book that was lost in the Cotton Library fire of 1731, but it had been transcribed previously. There is very strong evidence that Anglo-Saxon poetry has deep roots in oral tradition, but, keeping with the cultural practices we have seen elsewhere in Anglo-Saxon culture, there was a blending between tradition and new learning. Thus while all Old English poetry has common features, we can also identify three strands: religious poetry, which includes poems about specifically Christian topics, such as the cross and the saints; Heroic or epic poetry, such as Beowulf, which is about heroes, warfare, monsters, and the Germanic past; and poetry about "smaller" topics, including introspective poems (the so-called elegies), "wisdom" poems (which communicate both traditional and Christian wisdom), and riddles. For a long time all Anglo-Saxon poetry was divided into three groups: Cædmonian (the biblical paraphrase poems), heroic, and "Cynewulfian," named after Cynewulf, one of the only named poets in Anglo-Saxon.The most famous works from this period include the epic poem Beowulf, which has achieved national epic status in Britain. Symbolism was an essential element to Anglo-Saxon culture. Julian D. Richards suggested that in societies with strong oral traditions, material culture is used to store and pass on information and stand instead of literature in those cultures. This symbolism is less logical than literature and more difficult to read. Anglo-Saxons used symbolism, not just to communicate, but as tools to aid their thinking about the world. Symbols were also used to change the world, Anglo-Saxons used symbols to differentiate between groups and people, status and role in society. Symbolism continued to have a hold on the minds of Anglo-Saxon people into the Christian eras. The interiors of churches would have glowed with colour, and the walls of the halls were painted with decorative scenes from the imagination telling stories of monsters and heroes like those in the poem Beowulf. Although nothing much is left of the wall paintings, evidence of their pictorial art is found in Bibles and Psalters, in illuminated manuscripts. The poem, 'The Dream of the Rood', is an example how symbolism of trees was fused into Christian symbolism. Richard North suggests that the sacrifice of the tree was in accordance with pagan virtues and "the image of Christ's death was constructed in this poem with reference to an Anglian ideology of the world tree". North suggests that the author of The Dream of the Rood "uses the language of the myth of Ingui in order to present the Passion to his newly Christianized countrymen as a story from their native tradition". Furthermore, the tree's triumph over death is celebrated by adorning the cross with gold and jewels. Anglo-Saxon in linguistics is still used as a term for the original West Germanic component of the modern English language, which was later expanded and developed through the influence of Old Norse and Norman French, though linguists now more often refer to it as Old English. Throughout the history of the Anglo-Saxons studies producing a dispassionate narrative of the people has been difficult. In the early Middle Ages the views of Geoffrey of Monmouth produced a personally inspired history that wasn't challenged for five hundred years. In the Reformation, churchmen looking for signs of an English church reinterpreted Anglo-Saxon Christianity. In the 19th century the term Anglo-Saxon was broadly used in philology, and is sometimes so used at present. In Victorian Britain, some writers such as Robert Knox, James Anthony Froude, Charles Kingsley and Edward A. Freeman used the term Anglo-Saxon to justify racism and imperialism, claiming that the "Anglo-Saxon" ancestry of the English made them racially superior to the colonised peoples. Similar racist ideas were advocated in the 19th-century United States by Samuel George Morton and George Fitzhugh. These views have influenced how versions of early English history are embedded in the sub-conscious of people "re-emerging in school textbooks and television programmes and still very congenial to some strands of political thinking." The term Anglo-Saxon is sometimes used to refer to peoples descended or associated in some way with the English ethnic group, but there is no universal definition for the term. In contemporary Anglophone cultures outside Britain, "Anglo-Saxon" may be contrasted with "Celtic" as a socioeconomic identifier, invoking or reinforcing historical prejudices against non-English British immigrants. "White Anglo-Saxon Protestant", i.e. WASP, is a term especially popular in the United States that refers chiefly to old wealthy families with mostly English ancestors. As such, WASP is not a historical label or a precise ethnological term, but rather a (often derogatory) reference to contemporary family-based political, financial and cultural power— e.g., The Boston Brahmin. The French often use "Anglo-Saxon" to refer to the combined power of Britain and the US today. ^ The delimiting dates vary; often cited are 410, date of the Sack of Rome by Alaric I; and 751, the accession of Pippin the Short and the establishment of the Carolingian dynasty. ^ Sarah Knapton (18 March 2015). "Britons still live in Anglo-Saxon tribal kingdoms, Oxford University finds". Daily Telegraph. Retrieved 19 March 2015. ^ Higham & Ryan 2013:7"The Anglo-Saxon World"
^ "The Acts and Monuments Online". www.johnfoxe.org. ^ "Definition of "Völkerwanderung" – Collins English Dictionary". ^ 1935–2016, Campbell, James, (1986). Essays in Anglo-Saxon history. London: Hambledon Press. ISBN 0-907628-32-X. OCLC 458534293. ^ "Archaeology Staff Profile: Dr Heinrich Härke" University of Reading (www.Reading.ac.uk). Retrieved 6 March 2019. ^ Jones & Casey 1988:367–98 "The Gallic Chronicle Restored: a Chronology for the Anglo-Saxon Invasions and the End of Roman Britain"
^ "EBK: Adventus Saxonum Part 2". www.earlybritishkingdoms.com. ^ Hills, C.; Lucy, S. (2013). Spong Hill IX: Chronology and Synthesis. Cambridge: : McDonald Institute for Archaeological Research. ISBN 978-1-902937-62-5. ^ Bede, Book III, chapters 3 and 5. ^ Campbell 1982, pp. 80–81. ^ Robin Fleming Kings and lords in Conquest England. Vol. 15. Cambridge University Press, 2004. ^ Chibnall, Marjorie (translator), The Ecclesiastical History of Orderic Vitalis, 6 volumes (Oxford, 1968–1980) (Oxford Medieval Texts), ISBN 0-19-820220-2. ^ Chaney, William A. (1970). The Cult of Kingship in Anglo-Saxon England: The Transition from Paganism to Christianity. Manchester: Manchester University Press. ^ Owen-Crocker, Gale R. (2000). The Four Funerals in Beowulf: And the Structure of the Poem. Manchester UP. p. 71. ISBN 978-0-7190-5497-6. Retrieved 25 June 2012. ^ a b Jupp, Peter C.; Gittings, Clare (1999). Death in England: An Illustrated History. Manchester UP. pp. 67, 72. ISBN 978-0-7190-5811-0. Retrieved 26 June 2012. ^ Carver, M. O. H. (1998). Sutton Hoo: Burial Ground of Kings?. U of Pennsylvania P. p. 167. ISBN 978-0-8122-3455-8. Retrieved 25 June 2012. ^ Richards, Julian D. (2013-06-01). Viking Age England (Kindle Locations 418–422). The History Press. Kindle Edition. ^ Stenton 1987, p. 530. ^ a b Richards, Julian D. "Anglo-Saxon symbolism." The Age of Sutton Hoo: The Seventh Century in North-West Europe (1992): 139. ^ Alexander, Caroline (November 2011). "Magical Mystery Treasure". National Geographic. 220 (5): 44. ^ "The Find". Staffordshire Hoard. Archived from the original on 2011-07-03. Retrieved 14 June 2011. ^ Leslie Webster, Janet Backhouse, and Marion Archibald. The Making of England: Anglo-Saxon Art and Culture, AD 600–900. Univ of Toronto Pr, 1991. ^ Bruce-Mitford, Rupert Leo Scott. The art of the Codex Amiatinus. Parish of Jarrow, 1967. ^ Reynolds, Andrew, and Webster, Leslie. "Early Medieval Art and Archaeology in the Northern World." (2013). ^ Janet Backhouse, Derek Howard Turner, and Leslie Webster, eds. The Golden Age of Anglo-Saxon Art, 966–1066. British Museum Publications Limited, 1984. ^ Scott Shay (30 January 2008). The history of English: a linguistic introduction. Wardja Press. p. 86. ISBN 978-0-615-16817-3. Retrieved 29 January 2012. Wilson, David M.; Anglo-Saxon: Art From The Seventh Century To The Norman Conquest, Thames and Hudson (US edn. Overlook Press), 1984. Huge Anglo-Saxon gold hoard found, BBC News, with photos.